Barbara Walters is shuttering her annual ABC Oscar night special, signing off on March 7th with guests Sandra Bullock, Mo'Nique and clips from past shows. She made the announcement on Monday's The View, telling viewers, "ABC has asked me to keep doing these specials as they have always been so successful . . . But to be honest, I feel like I've been there, done that." Walters, 80, launched her Oscar specials on March 31, 1981, welcoming Ringo Starr, Barbara Bach and others. In the ABC release announcing The End, she noted the tingle she experienced when Oscar host Hugh Jackman gave her an impromptu lap dance last year. Walters also recalled a tango lesson from Al Pacio and a sit-down with Bette Davis. "It's those priceless moments that have made this special the Oscar tradition that it has become, but I truly feel enough is enough," she said. 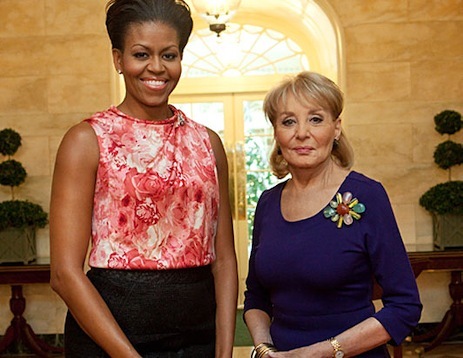 ABC said that Walters will continue hosting her 10 Most Fascinating People specials, with First Lady Michelle Obama emerging at the top of 2009's list.